Dig the first live broadcast of the Iron Leg Radio Show! You can tune in and join the chat, and the shows will all continue to be archived as a podcast in iTunes, TuneIn, Stitcher, Mixcloud and right here at Iron Leg. So join me on Saturday! It’s time for the 2017 Funky16Corners Pledge Drive. Since Iron Leg, and the Iron Leg Radio Show podcast are dependent of the continued health of Funky16Corners, and continue under the banner of the Funky16Corners Radio Network, it behooves me to post these links here, too. The pledging will also take a slightly different form this year, moving to Patreon (click here or on the logo below to go to the Funky16Corners page) , where you will be able to spread your contributions out over the entire year, which will help cover the ongoing server/broadcast/hardware expenses. This year has seen the upgrade of a couple of crucial pieces of equipment, and any help you fine people can provide will keep the machinery moving here at Funky16Corners central. So please dig deep so we can continue to do the same! The record you see before you made its way into my crates a few years back via the inclusion of an early version of the the song ‘What’. That tune, written by HB Barnum was originally recorded by Judy Street and went on to become a Northern Soul classic. 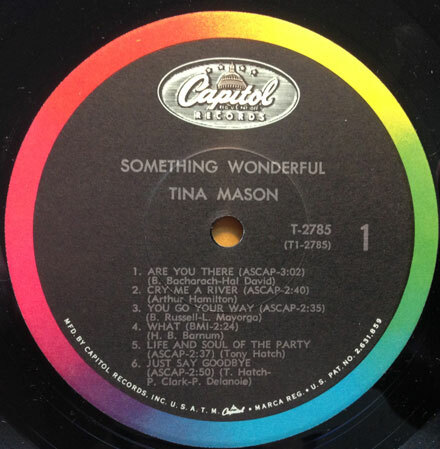 The version by Tina Mason (recorded/released shortly after the Street 45) is a slightly slower, more stylish affair, but still cool. Mason had a short but interesting recording career, first with Tina and the Mustangs on Capitol, then on her one full album. She had a certain amount of Southern California success, having performed at Disneyland and then becoming a regular on ‘Where the Action Is’ (where she met her future husband, Phil ‘Fang’ Volk of Paul Revere and the Raiders. Her 1967 album ‘Is Something Wonderful’ was produced by David Axelrod and arranged by HB Barnum (no doubt the reason she recorded ‘What’) and features a wide variety of sounds. Mason’s stuff walked the line between girl-group and soul, as well as a certain kind of sophisticated pop. Today’s selection is a great cover of the Bacharach/David ‘Are You There (With Another Girl)’ (title truncated on Mason’s album), which was a hit for Dionne Warwick in 1965. Mason’s version is a great showcase for her voice, backed with a lush arrangement, sounding like a kinder, gentler wall of sound. There’s a booming bass, shimmering rhythm guitar and understated strings and brass, with a female chorus backing Mason’s lead vocal. The production by Axelrod is typically first-rate, and it’s a wonderful take on a great song. The LP is apparently pretty hard to find these days, but it was reissued (with bonus tracks) on CD in 2008 by Now Sounds. Make sure you check out my weekly show for WFMU’s Give the Drummer Radio, Testify! . If you dig Funky16Corners and/or Iron Leg I think you’ll dig it. I’ll be on the air every Wednesday night from 10-12, live, so tune in when you get a chance! I come to you today with one of the grooviest mod Hammond 45s ever pressed into polyvinylplasticwhatever. 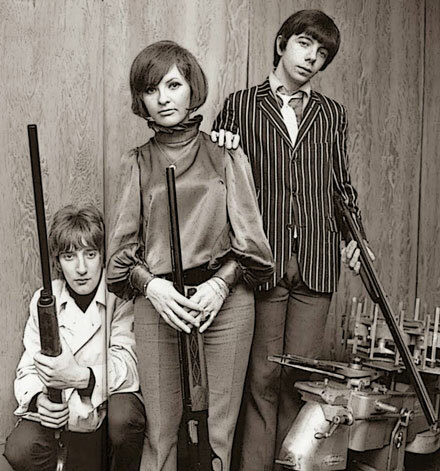 The Shotgun Express were a short lived sort-of-supergroup, featuring Rod Stewart, Beryl Marsden, Peter Bardens, John Mooreshead and Phil Sawyer (Bardens, Mooreshead and Sawyer all having made their way through the UK beat and beyond scenes). The group only ever waxed two 45s (gathered in Europe on a single EP), only one of which was released here in the US, all in 1966. Today’s selection is the flipside of the first Shotgun Express 45 (the topside of which was featured in the space previously). 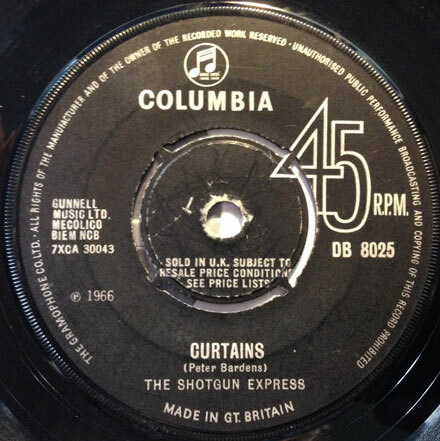 ‘Curtains’ is a hard charging, dance floor ready feature for organist Bardens, as well as some absolutely pounding bass and drums that muscle their way through the mix like a truck speeding down the street. It is a superbly played and produced side, that manages to blend R&B and jazz expertly with enough verve to get the kids in the bespoke suits off their scooters and on to the floor grooving. Big thanks go out – as always – to my man Mr Luther who first fed this one into my ears via mixtape decades ago. I was lucky enough to finally score a copy of my own (the UK issue, with the US 45 on Uptown being even rarer) a few years ago, and it holds a place of honor in my crates. I hope you dig it as much as I do, and I’ll see you all next week. Offered today for your delectation is the most recent episode of my show Testify! which sails out over the airwaves live, every Wednesday night from 10-12 on WFMU’s Give the Drummer Radio. Since it is at its heart as Iron Leggy as it is Funky16Cornered, I thought you might dig it. 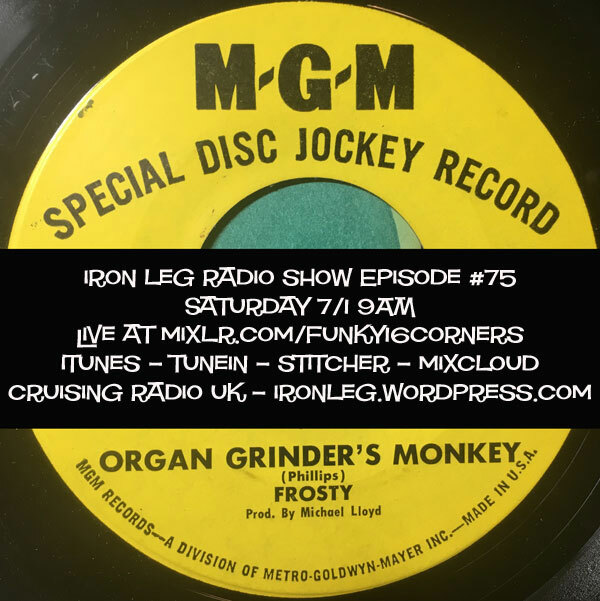 I also bring you news, that being that the Iron Leg Radio Show will – as part of the Funky16Corners Radio Network – be going live as well, on a monthly basis. I will provide more details as the date of the first episode approaches. Until then, dig Testify! (tune in on Wednesday night) and I’ll see you all next week. Welcome to this month’s episode of the Iron Leg Radio Show. We have lots of groovers for you this month, including lots of new arrivals, a set of cover versions of John Buck Wilkin songs and some old faves as well. So pull down the ones and zeros, dig it and I’ll see you next week. Make sure you subscribe to the podcast in iTunes!